Appledore Island, in the Isles of Shoals off the coast of New Hampshire and Maine, is a fairly inhospitable spot these days. Its lunar-like landscape is now home mostly to some very aggressive seagulls. 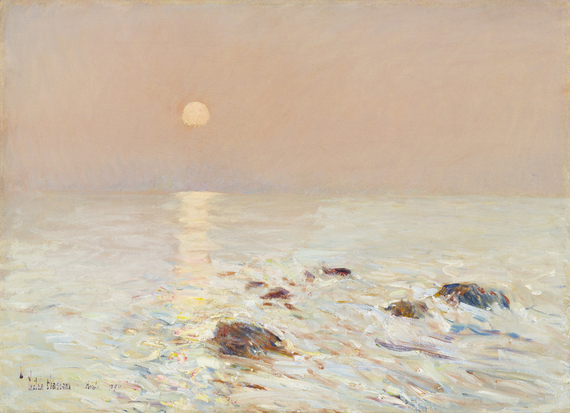 Childe Hassam, Isles of Shoals, 1912, watercolor on paper, Private Collection. Photography by Jesse Boles. But in the late 19th century, it was an artists' colony and hot spot for the tourist trade. The Appledore House hotel famously drew in artistic and literary luminaries like Nathaniel Hawthorne, John Greenleaf Whittier and Oliver Wendell Holmes. 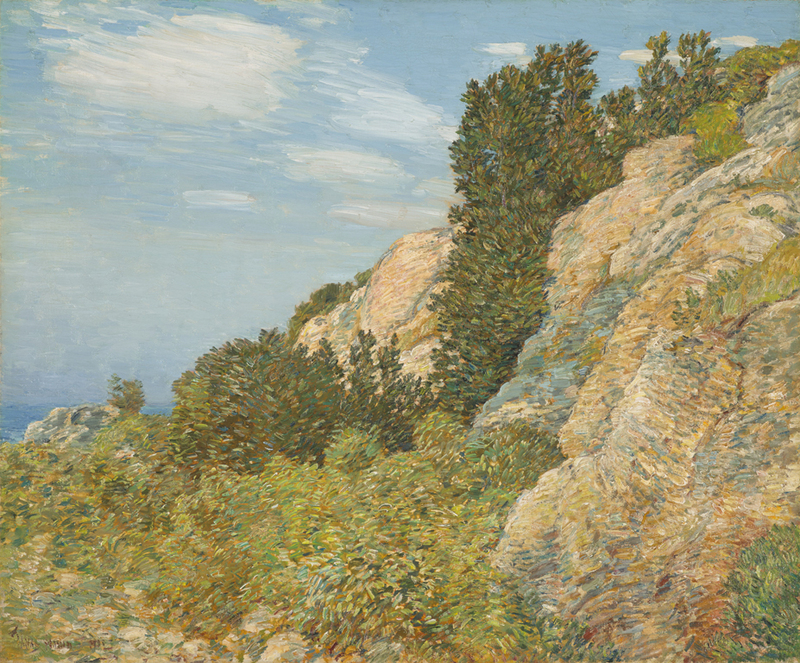 Among the artists summering there was Childe Hassam, America's pre-eminent Impressionist. "He's now pretty much universally regarded the as finest American painter in the Impressionist style," says John Coffey, deputy director for art at the North Carolina Museum of Art (NCMA) in Raleigh. "Even in his lifetime he was referred to as the dean of American Impressionists." on paper. Courtesy of George M. and Linda H. Kaufman. Now Coffey - with help from Austen Barron Bailly at the Peabody Essex Museum in Salem, Mass., Kathleen Burnside, co-director of an unpublished catalog of Hassam's paintings, and Hal Weeks at the Shoals Marine Laboratory - has organized an exhibition of 39 of his paintings at NCMA. Wait a minute - a marine lab? 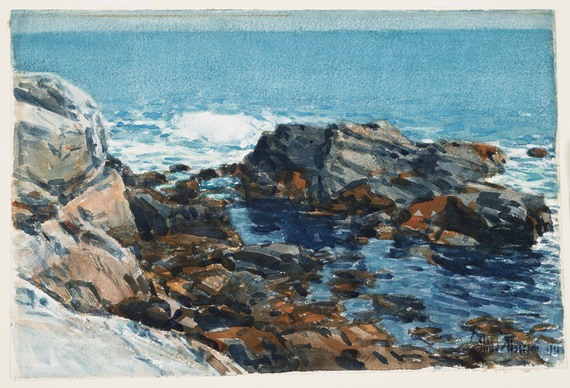 "Hal Weeks has a sort of hobby of locating Hassam painting sites - he knows Appledore Island like the back of his hand," he says. "He invited me out to the island and I went out there four years ago and I was blown away." Childe Hassam. The Laurel in the Ledges, Appledore, 1905. Oil on canvas. North Carolina Museum of Art, Raleigh. Promised gift of Ann and Jim Goodnight. Weeks and Coffey visited the actual sites where Hassam painted, to see how faithful the artist was to the site and to the geology and the personality of Appledore. "He was painting a mosaic portrait of this one very small island," he says. "It's constantly changing and it's fascinating - even though it's small, it's broken up geologically." 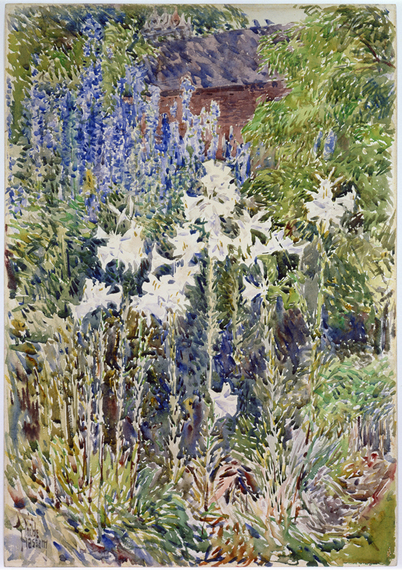 The curatorial team set about tracking down Hassam's Appledore works from as far away as the Honolulu Museum of Art and the National Gallery in Washington, D.C. They managed to locate two paintings of a seascape done at different times of day and almost a decade apart. Childe Hassam. Morning, Isles of Shoals, 1890. Oil on canvas. North Carolina Museum of Art, Raleigh. Promised gift of Ann and Jim Goodnight. "One is a sunrise over a beach, and then nine years later he goes back and paints a moonrise, with the same rocks in the same location," he says. "Clearly, he intended them as a pair but we don't know why. We've put them together for the first time in at least a hundred years - we don't even know that he ever exhibited them as a pair." Childe Hassam. 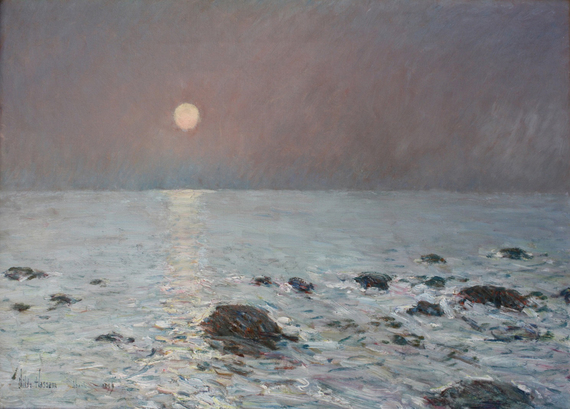 Moonrise, Isles of Shoals, 1899. Oil on canvas. W. Donald Head, Old Grandview Ranch, California. The exhibition - curated so that visitors take a tour of the island as they move through the gallery - opens on March 19 and runs through June 19. So why would anyone care, anyway? " "The paintings are just drop-dead gorgeous - they're so damn captivating," he says. "When you get into it you can understand not just the artist, but his fascination with this place as well."